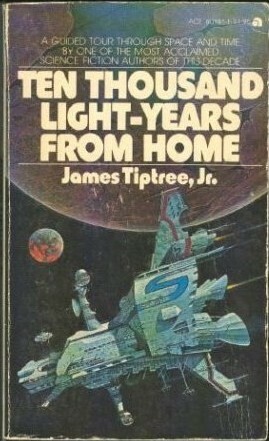 “Painwise” © 1971 James Tiptree, Jr.
Wooo. It has been a long time since I’ve updated this blog. It’s always been in the back of my mind, though. TTLYFH sits on the top of my pile of books on my bedside table (which happens to be five books deep, not to mention the ARC I have to finish at some point and the pleasure reading book I have. …And a knitting guide I want to finish reading. The point is, I am in the middle of a lot of books.) I’ve also drifted a lot from adult science fiction. I rediscovered YA, particularly fantasy, last year and spent my time making my way through various YA series. To reboot my attempts to do reviews of all 69 of Tiptree’s short stories, her collected essays and poetry, and her two novels, I’m glad “Painwise” was next in the book. My first thought upon reading most of these stories is,” I don’t know what to make of this, but…” Proof that most of these stories need at least a second, and perhaps a third reading. In most cases, you just will not understand what is happening until at least half way through the story. “Painwise” is definitely one of those stories that benefits from a second reading. Having been stuck in YA land for a while, it was almost annoying to get back into the thick stories and prose that Tiptree loves. However, when I finished, I put down the book, went and made cookies, and then came back and reread the story. It is still a bit thick, but it makes much more sense. The story starts in media res, which just adds to the initial confusion. It literally jumps right into the title of the story with “He was wise in the ways of pain. He had to be, for he felt none” (118, Ten Thousand Light-Years From Home). The human man, who remains unnamed for the rest of the story, had his nerves reattached to something other than pain receptors by scientists sometime before the beginning of the story. What I gathered from rereading it was that he was then sent off to explore habitable planets in a single-man, mostly automated spacecraft, called the “scouter.” The reason he was altered to not feel pain is due to the inherent danger of his mission. The first page of the story lists several ways he has been tortured by alien races upon landing on their planets. Instead of feeling pain, he sees flashes of color. He has also been altered to be somewhat indestructible. Every time he is injured, the scouter picks him up and the boditech puts his back together. The boditech is a separate semi-organic computer that is trusted with making sure he lives and gives a report upon returning from each planet. Understandably, the fact that he can feel no pain and is on a seemingly endless journey begins to drive the man insane, which is where the story picks up. He realizes he can get the boditech to speak to him if he claims to be injured and then starts purposefully injuring himself in really gruesome ways, especially whenever he is dropped off on a new planet. He tries to teach the boditech that he will stop injuring himself if she (yes, she) talks to him. He names her Amanda, and falls in love with her in his own twisted, Stockholm way. His main purpose is to convince her to turn the scouter back towards Earth, because he does wheedle out of her that they are overdue for the signal that should have called them home. He has no idea what he will return to, but above all else, he wants to go home. The scouter’s main computer takes over “Amanda,” and forces him to resume his mission until an alien psi-force invades the ship and destroys it, teleporting him inside their own ship, which is some kind of organic shell-pod. Inside he meets the three aliens that psychically move the ship: a golden bushbaby, a psychedelically colored butterfly creature named Ragglebomb that may or may not be one of the Dameii from the numerous Stars’ Tears stories (I will have to come back to you on that), and a black boa named Muscle. They are all three empaths, and slightly telepathic. Ragglebomb is also psychic and is the one who moves the craft though space. Their mission? To eat as many delicacies from as many worlds as possible. The problem is that while they are shielded within their ship, once they go out onto a world, they feel all the pain and suffering that is natural of any living thing. You can see why they picked up this human man who does not feel pain. As powerful empaths, he is the ultimate balm for them. They send him down onto the worlds they find to pick up delectable foods for them. So he basically is on the same kind of mission he was on as before. And once again, it starts to drive him insane. They tell him they are on course for Earth, be he eventually learns they do not know where it is, having never been there. The man falls into despair and refuses to eat, thinking he will never see Earth again, or at the very least, it will take thousands of years if he truly is undying. A passing comment the Bushbaby makes catches his attention because he thinks it could have only come from Earth. So he begs them to go back to whatever planet Bushbaby gleaned it from. He cannot get out of the pod fast enough once they land, and the moment he is on the ground, his body erupts in the strongest, most crippling sensation he has ever felt. Having never felt anything like it before, the empaths must explain that it is pain he is feeling. They are also in agony since they are still connected to him. He realizes that his pain receptors were tuned away from feeling pain at bodily harm and instead tuned to feel pain at the very environment of Earth, proof that whoever sent him on his mission ever intended for him to return. He starts to crawl back to the pod to escape the searing pain so they can leave, and just before he climbs in, he thinks about how he can continue on forever, never feeling pain with these aliens, or he can suffer for however long he has left on his own Earth. He chooses the pain and Earth and sends them away. Funny enough, “Pain” by Three Days Grace just came on as I was writing this. Actually, their two points dovetail here: “I’d rather feel pain than nothing at all.” While repetition can certainly drive someone insane, as pain is the main subject of the story, it is the lack of an ability to feel pain that ultimately drives the man crazy. And he would rather embrace this pain than live forever in reasonable comfort, feeling nothing. Pain has been described in many different stories as being one of those things that is a sign of being alive, and while that is not openly stated here, I believe that is the point of the story. After all, what is life without pain? How can one experience happiness without knowing suffering? It is also interesting that the lack of pain becomes its own form of torture for this man, as opposed to the more physical bodily harms he goes through at the beginning. After rereading this story and thinking about it a bit, I decided 5 out of 5 stars. I really liked it, and it really got me thinking about what exactly pain is. I had a very emotional reaction to the end of the story, especially the second time once I knew what was happening. And the good thing is it’s available for free online here! Now go read it.